Search for Connections Business Directory Hours. Now that Hours is installed and activated, let’s enable it so it is displayed. First, navigate to the Connections : Settings admin page and click the Display tab. Next, scroll down to the Result List : Content Blocks section and enable the Business Hours option. 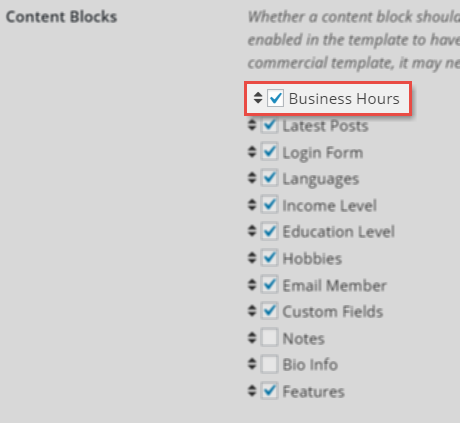 Then scroll down to the Single Entry : Content Blocks section and enable the Business Hours option. You can choose to display the Business Hours Content Block in either the Result List or the Single entry Content Block sections. You do not need to choose both. Drag and drop the content blocks in the order you prefer them to be displayed. Lastly, click the Save Changes button. In addition to displaying the business hours using the Content Blocks you can display the business hours of operation in the theme’s sidebar using the included widget. The widget is highly configurable, providing you with many options.